A few minor amendments were incorporated into a revised version with a new cover photograph in July 2017, when it was transferred to our Studies in Merton History series as No.9. there is the shop floor, where rumours would often abound. final day in 1982, are entirely those from the shop floor. will follow in another publication. 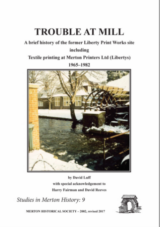 Mill’, which along with ‘Libertys’ have never been published to date. historical inaccuracies have appeared in print with regard to the works. Reeves (20 years service), without whom this book could not have been written with such historical accuracy. for supervising the processing of all photographs within this book. for turning water wheels in those days when Britain’s industrial power came from the wind and water. industrialisation of the site, the cut has been enlarged and finally took over as the main course of the river. Thames from the hills to the north and south. area now used as car parks for the Mill complex and SavaCentre. grey calicoes to be bleached white. either gum or pins, or merely laid flat. the design would go unnoticed. Detail from 1933 Ordnance Survey map. established in the calico industry. a valuable asset during periods of drought when the river level would have been low. During the early years, Littler had his blocks cut by Mr Lawrence, who had a workshop in Phipps Bridge Road. This enterprise later moved onto the Littlers works’ site, although I doubt if this was the only source of block cutting. industrial base which had been taking place virtually since Edmund had arrived in Merton. entire production of prints was for Libertys. risk of the wooden workshops. the second world war in 1939.
source were heralding its rapid decline. had their effect on the Wandle valley but more devastating was the rise in steam power. away from such areas as the Wandle valley, which could also have hastened its decline. able to pick up some, if not all, of the orders on offer. of the colours and chemicals were struck into the fabrics, a small proportion did run out during the washing. multi-coloured downstream of the Littlers’ mill, as were other such sites along the river’s banks. up and all were a potential fire risk. and Cottage provided these facilities. with the Pavilion and rockery behind. iron hotplates all within the design of the workshop. and had the habit of dislodging them, and especially so during windy weather. being trained here at periods during its working life. the side buttresses have been built onto above ground level and form part of the workshop’s design. pathways, lawns and flower beds. of flats built in Phipps Bridge Road (now Liberty Avenue) and they were appropriately called ‘Liberty Flats’. They can still be seen today at the Christchurch Road end of Liberty Avenue. The pagoda bridge that crossed over the moat. necessitate the screens having to be rolled flat once again. apprenticeship to learn this trade. printing shop and office complex. with the wooden handle-end of a mallet. printing in the late 1950s and continued in use until 1970.
become tradesmen but treated purely as labourers, but it was work. redevelopment been completed, their staff would have almost doubled. The war started off fairly uneventfully on the home front with the period now known as the ‘phoney war’. vital should the war become a prolonged affair. manufacturing of consumer goods, a restriction on raw materials for such products had the same effect. Those factories, warehouses and businesses that could, adapted themselves to some form of war production. businesses that sprang up nation-wide. one, but they never disappear altogether. were showing our recently-acquired east-European allies, the women of whom all seem to be wearing them. screen-printing shop and office building to Parnall Aircraft Ltd.
under which an overhead crane could be manoeuvred along on a central girder. cumbersome two-storey building, it originally had a large canteen on the ground floor with offices on the first. the print-works, it never seemed to fulfil its potential. not fully paid up, as I write in May 2001.
returning to Liberty’s in Merton this would be their only break in service from leaving school to retirement. of one model railway manufacturer who tooled up a number of items under the guise of the war effort. Parnall had become a very successful enterprise during the war and made the transformation into Civvy Street. Last time I heard of them, after many takeovers, was in 1989 as Jackson Electronics of Stoke. never seemed to fit in correctly and was certainly under-used. form of printing carriage running on rails, 52- or even 62-yard tables would have been a better proposition. years, and helped seal the fate of Merton Printers Ltd.
entailed a specification that would not be required for the screens. short 15-yard table used for the striking off of new set of screens and for sample printing. tables and a separate set of racks for the sampler and strike-off printers. area of Lyon. Here they saw many different styles of hand-printing, with some using hand-operated carriages. made the carriage one-man operable, even with the 50-inch cottons. which became known as Coles Shop. (There is no ‘The’ in the name). support, though it had been extremely popular between the two wars, and only the football team continued. and, after attempts to burn it down on two occasions, it was demolished. store until its final demise in the early 1980s. and pay. The print works had the better pay rates while the warehouse was considered a much cleaner job. film crew were working for. Wimbledon via Merton Abbey, all motor vehicles used the Littlers Close entrance. Abbey Print Works, where small individual workshop buildings attempted to cohere into one working unit. a liability. By the early 1960s Liberty were seriously contemplating moving the print works to the Midlands. a fire at the Macclesfield print works of Artcraft had a profound influence on the final decision not to move. why he bought an Italian flatbed when I know that the original intention had been to buy a Swiss model. necessarily have to be extensively large with a high ceiling area. and specifically the hand-printing tables, became almost a forgotten entity. happened and a sudden surge of water caused the wheel to turn and a large number of paddles were smashed. was purely a cosmetic restoration not requiring all paddles, as it was not intended to restore it to working order. not, fortunately, at a great pace or for a long period. and the individual company’s finances all have an effect on the day-to-day life inside the factory gates. printer and tierer had now become the screen-printer and servicer. only to spend my first day in the works but also the following seven years. the fabric to be printed stuck onto the backing cotton, but also that the threads were perfectly straight. had to be done over a number of years for financial reasons and had reached 42½ by January 1965.
amount of oil that had been used as a lubricant during the weaving process. or left as natural, an off-white colour. White is not a natural colour and is only achieved by bleaching. called a stenter. It had now become ‘white stock’ and ready for printing. to it. 200 yards could be steamed at each session. chest was installed in 1938.
and the former sports pavilion. This unusual location had become the home of our screen-making department. there was the central area where the engraved screens were finished off ready for printing. of young vandals is considered to be a bad image on society, they won the day and the Pavilion was demolished. a light-sensitive emulsion. It was dried and then placed onto a light-box where a negative had been secured. the screen was then ready for printing. did not continue in such use during the post-war Liberty years. It had by 1965 become the ‘white-grey’ stores. superb, exciting and outrageous, that put Liberty in the dizzy heights of the world textile trade. suitable for long print-runs and this is where a 52- or 62-yard table would have been a better project. It also had a high very cluttered ceiling area full of girders, pipes and light fittings, all open to the floor below. Dust accumulated here and inevitably fell onto the printing machines below. the northern end of the 1905 Wash House. but an abbreviation of the machine-manufacturers’ name, Mecanotesselle. from our own maintenance staff, to assemble our new flatbed-printing machine. 62 yards in length. Each had a hand-operated printing carriage running on it. were rather cumbersome slow-moving machines and not really successful at Merton Printers. were far faster and did not require electricity to run them. carriages fell out of use and were replaced by hand-operated ones. They were eventually sold for scrap. all for a screen-printing shop. who had come from Artcraft, also retired around the same time on grounds of ill health, or so we were told. complete move to South London. At the time of the arrival of the new chemist we already had a very capable one of our own, Mr Wooley. a specialised industrial trade that required the expertise built up over years of working within the factory. blinkered policy would eventually have devastating consequences for the works. beginning of the decline that led to the closure of the Works. later book. We never had one on the printing machines at Merton. and uneconomical and, although we would still print the wools, we could no longer print silks. supply. This led again to the appointment of salesmen to scour the country looking for print-orders. and washing range all capable of handling that period’s level of production. only relieved the older one at times of large orders of vat-coloured furnishing cottons. of the complete production line. table printers. This was mainly due to the shift working and particularly the late and night shifts. a long way in improving the recruitment situation. needed to run longer than the printing departments. did not change anything. The prints just kept on rolling off the end of the printing machines. behind the Screen Store. No doubt the latter was too far for some persons to walk. them. Unfortunately, as time would unveil, all was too late. of screen-making and sample-printing to the direct control of the Liberty Studio. were allowed in but had to obtain permission first. 16 inches and 24 inches to 36 and 48.
abandoned, with 36-inch repeat being the largest. This should have set a precedent for the following years. Print Works and the site. the reaction of those around me, but I do think that many felt somewhat betrayed. Luftwaffe had done in six years of bombing. site, but chose to give it away for a song. This was to safeguard our pay and contracts of employment. Blair ultimately passing in the early 1970s, it left Susan as the head of the Liberty Design Studio. part of the Vita Tex group. the Liberty Studios in the Front Shop. by some so-called historical publications. have seen a doubling of the staff at the Merton Abbey Print Works. song and Libertys stuck with us over the years, through thick and thin. only, and we are left to speculate what could have been if the world had been a different place. course, not just any other, they were the most important. Without them we would not have been viable. floor of The 1929 Shop and the first floor and attic of the Front Shop. Brian, was always the most approachable and would speak to anyone who wanted to converse with him. well not at Merton certainly. investment would have to be put off until the situation improved. one, and not ten years down the line. tables were installed with two screen-washing bays and a waist-high tank for the washing of the squeegees. have been the 1929 but at the time of the move it was being rented by Liberty Warehouse. necessitated the relocation of all departments here, most of which were destined for the Screen Shop. was extremely noisy for those working inside this shop. One of the casualties of the move was the vat-coloured fabrics fixing and full-width washing range. Fortunately they were not scrapped, but simply stored in the open on the western side of the river. made this location suitable, but at the time there was no other workshop available. the departments. This allowed steam from the winches and washing range to drift around. contracting, which led to misfitting, while on others the gum dissolved, causing the nylon to slip off the frames. high-pressure water-jet gun to remove it from the screen-printing area. many pins and you had to watch your fingers. would not necessarily have been within the machine screen-printing department, but none took his offer. uses with the coming sale of part of the site. the Machine Shop, along with a new Screen Store on the eastern side. Shop. It is in process of opening. He persuaded the factory’s owners to purchase a second Buser flatbed-printing machine, which duly arrived. model. With this type no longer in production, it was offered for sale. it possibly could still be working today. had hit Britain’s industrial base. not again show such a Dunkirk spirit. using the River Wandle. It just made it too uneconomic, and a diesel generator was hired instead. once more to print vat-coloured cottons. slower than an equivalent hand-operated carriage. but this practice had been discontinued a few years earlier. along with this floor of the 1929 Shop, they were leased to Rustichina. up for sale. We were told that Vita Tex no longer regarded Merton Printers to be part of their expansion plan. shop floor behind him. I am not fully informed why it never came about, but it all ended in June 1975.
the background, there was no reason to believe the June meeting to be anything other than normal routine. On returning, Brian informed us that he had resigned. He had become a very popular Works Director and he was certainly very sadly missed. The End of Merton Printers Ltd.
Merton Printers Ltd, with money to invest so long as it could be earned. more placed orders in our Works. redundant, all of which took effect on Christmas Eve 1975. 5 and none that I can recall of 3 days. long as you were one of the chosen few, of ‘making hay while the sun shone’. just the pockets of a few. sucking out the hot air. However, it was most certainly better than nothing, as we would very soon find out. hot air in the summer. to service and repair them. windows, they were opened up again. a large piece of wood prevented the entire mill from being demolished. management were not experienced enough in the art of textile printing. Liberty, who was himself very approachable. precise detail of what any sale would have entailed, but my feelings are that it would have been leasehold. be spent on refurbishment to be viable. which Laura Ashley could easily have transferred to their South Wales printworks. and various persons walked about the Works sticking ‘sold’ labels on items while we were still using them. in closedown rather than take-over. Merton Printers Ltd finally shut down on 31st July 1977 and the name passed into history. shelter, between Coles and The 1926 Shop, which had become the main Works’ office. in the whole of The 1929 Shop. any increase in payments for these prints. being that we no longer printed the very large at-cost orders. for Merton Printers had neglected his duties, and paid for its overhaul. the six electric motors until they were working in complete harmony with each other. late 1970s. This was once again largely due to an increase in oil prices. and there being no time for any objections. tables here. Unlike the Liberty tables these would have run east to west, not north to south. carpets. They appeared to me, and I never saw them working, to be either semi- or fully-automatic carriages. certainly the right way forward, but I’m not too sure these tables were really the way to do it. and resale of redundant industrial machinery. to Charrington had led to them calling in the Bank, who in turn called in a Receiver. did not in any way affect Rustichina. from the government insurance, of which all PAYE employees were members. kind, and had to return the following Tuesday when this would be sorted out. £120 which would have to be paid back when the government insurance paid out. Riselime had now, like Merton Printers, passed into history. at the eleventh hour, it had been saved from total extinction. was no possibility under any circumstances of the lease being renewed. as the main office, dealing with all wages, paid monthly, and all bills. August 1981 saw the works reopened as Merton Fabrics Ltd. It immediately ran into a number of problems. and our new supplier, Shell, insisted on cash-on-delivery. Liberty continued to show their loyalty by placing regular orders for their varuna wool and furnishing cottons. After all the uncertainties, the ups and downs, they were still supporting us. gave us a white Christmas which continued off and on throughout January. but then slip off in the middle of printing. Once the warmer days of early spring had arrived, winter was forgotten for another year. textile world and succeeded in obtaining large print-runs of a single spot design. our smaller Buser to David Evans of Kent. had been burnt to cinders. all looked very suspicious, with a number of separate fire points. an electrical fault, caused by one of the machines being left on. years of total neglect, these tables were in urgent need of complete refurbishment. a clean-up where possible, while an evaluation took place over the future of Merton Fabrics Ltd.
the flatbed-printing machines and then have to move them within a period of one year. on holiday were never to return and only three of the clean-up team survived redundancy. informed of the idea, but were not in agreement. designs for that year’s varuna wool range. These were being engraved and test-printed at the time of the fire. took place on the sample tables in Coles Shop during August. These were flags for the Gas Board showrooms. print-run at the Merton Abbey Works. Once this was completed, the end had finally come, and this time the phoenix would not rise from the ashes. of the year and the final day of the Printworks was 24th December 1982 – Christmas Eve. on the Liberty site but, as time has shown, they were not successful. but usually does cost money to run. forever as time passes by. photographs and artefacts, but nothing ever evolved from the meeting. war. However, this is Merton Abbey Mills, and it is not my intention to deal with their history. as the ‘Loft’, and this name stuck, regardless of where the finished prints were being inspected. to complement this new history, though it was never known as such during its working life. version, although not correct, and would not change it. Hackbridge printworks being set up and used in this shop. name used, only 1926 Shop or Colour House. Named after its design, it was the only workshop to retain one name regardless of what took place within. It was the second workshop built by Liberty, the first being the Wash House, built in 1905. Another workshop named after the year it was built. For many of my years it was known as the Warehouse. workshops, but the present ramp and shops have totally destroyed its unique character. Simply named after the location of the storage of the printing-blocks. Always known as such. Used by Liberty for many years as a stationery store. office block can be seen. Up to and during my years, we were in the very capable hands of the Transport and General Workers Union. with the Works’ management who were, in reality, negotiating on behalf of the owners. After Liberty sold the Works, all subsequent owners accepted the Transport and General Workers Union. Charles had taught us to stand on our own feet, his personal expertise was greatly missed. Hospital’. It was said that he had the wounded from his sea-battles treated here. A nice story, but not true. transport of the day, should have made the story a non-starter. demolished, its history had become transferred to the Old Colour House. a hospital connection, but I am sure it is the former that is wrongly associated with the Old Colour House. certainly not constructed of the same material as the still-standing section of the known Priory wall. advantage of the former road’s high dry ground in an otherwise marshy area. accurate in the past centuries. to play in the continuation of time, albeit anonymously and totally forgotten as the years pass by. Home for the Night Watchman used to be a small hut by the Watermill, which he shared with the day Yardman. meagre pension, or someone whose health prevented other forms of employment. around where he liked. One that I recall certainly had an eye for the lady dogs and often went missing. at least they have not all been forgotten. the background is Libertys’ own livery van. endorses opinions expressed by authors of its publications. This entry was posted in Publications, Publications, Studies in Merton History and tagged in liberty's, merton abbey, mills, printers, studies, wandle.